The Roseanne revival, once just a segment on daytime TV, became a ratings-devouring reality earlier this year, bringing in 27 million viewers with its two-part premiere in late March. Those are Big Bang Theory numbers, which are increasingly difficult for network shows to hit, let alone one with such a controversial lead. But the 10th season of Roseanne is an undeniable hit, though it’s hard to say how much of the blue-collar sitcom’s resurgent success is owed to a newfound right-wing audience, morbid curiosity, and/or its stalwart fans. With season 11 already ordered and the finale, “Knee Deep,” having come and gone, The A.V. Club is delving into the show’s strengths, weaknesses, and future. Danette Chavez: I went into the revival with eyes open and an open mind—I was a fan of the show in its original run, and of the lovably flawed family at the center of it. But that background just made it more difficult to reconcile the Roseanne Conner I grew up with and the matriarch of this continuation. Not long after the show was officially green-lit by ABC, news broke that the fictional Roseanne would join her real-life counterpart aboard the Trump train, despite nine years of characterization that clearly refute such political alignment. I’m not the only person baffled by Barr’s decision to make her fictionalized self adopt her real beliefs; former writers for the show tell BuzzFeed they don’t recognize the character anymore. But Barr and some of her fellow executive producers, including Bruce Helford, have insisted that the Roseanne we once saw protest working conditions at a Lanford factory would have bought into Trump’s insincere appeals to the (white) working class. They would also have longtime fans believe the Roseanne that featured the first homosexual wedding of a recurring character in a network TV series could somehow retain the same socially-conscious framework, despite its star having becoming a transphobic Twitter troll. What are your thoughts on how the revival has handled the ostensible political divide in the family, Alex? And does this recommendation to separate the art from the artist fly? Alex McLevy: I think we’ve had different interpretations of the show since it began, Danette, even if there’s very little we disagree on when it comes to our thoughts on the real-life Roseanne. While you were cautiously ambiguous about it after watching those first couple episodes, your opinion has more or less gone downhill since then. You think it’s bad, with little redeeming value, thanks in part to the reworking of Roseanne Conner into a Trump supporter and the show’s changed political tone. Even the way you characterize the possible reasons people are watching—either they’re part of a new-found right-wing audience, or they simply have “morbid curiosity”—speaks to your belief that sensible people wouldn’t enjoy this new iteration of Roseanne. Allow me to make the case. First of all, I don’t think the writers have gotten enough credit for making a relatively funny sitcom. The jokes on the new Roseanne are pretty good, but they get lost in the controversy. With people like Morgan Murphy and Wanda Sykes working behind the scenes, the quality in writing doesn’t surprise me, but it does surprise me that the series isn’t getting credit for achieving something akin to the blunt and biting tone of the original. Even that BuzzFeed article you mention above is a bit misleading if you read to the end, and learn that the majority of former writers they spoke to (the ones who “don’t recognize the character”) all agree the new show is actually decent. They compare it to a friend you haven’t seen in a long time, and are surprised to see how much they’ve changed. And that, to me, is a big part of what makes sense about the new version: the changes to the main character that everyone dislikes so much. Like a huge percentage of people in this country, Roseanne Conner is a once-progressive woman who slowly succumbed to the fear-based appeal of conservative propaganda, currently embodied by our groper in chief. I find it very true-to-life and honest to depict a white senior citizen whose politics have become wholly more right-wing than they once were; similar people make up a large chunk of my parents’ social circle. And so, suddenly people who loved the “honesty” of the old Roseanne aren’t such big fans of it when it goes against their own ideology in a blatant way. This is understandable—no one likes to be confronted with viewpoints they find ugly or indefensible—but people with opinions you find odious are part of everyday life, including on television, and sometimes they’re characters you formerly admired. We used to deal with them on a regular basis—if you have family, you probably still do—but the internet has largely turned them into bogeyman you can dismiss or dehumanize, much as they do to us in turn. I get people’s exhaustion with the oversaturation of “Trump voters are people too!” think-pieces in actual journalism, but in the primetime network landscape, this is about it. Maybe it’s my own attitude toward pop culture that is made by a great many people, but I don’t think one crazy person on a TV show’s cast (admittedly the star) negates the overall project, any more than Orson Scott Card’s reprehensible anti-gay views mean you shouldn’t watch Ender’s Game, a movie hundreds of people worked on, many of whom likely share the same views as you. If you’re going to be honest about an aging white couple in America, there’s a good chance they look something like the Conners do now. I don’t see that on sitcoms much these days, and while I think the premiere went over the top in re-staging the culture wars, subsequent episodes have treated Roseanne and Dan’s increased conservative leanings (mostly Roseanne’s) as part of the texture of the show, rather than the point. But Danette, you mention your dislike of how no one but Jackie has challenged Roseanne’s pro-Trump stance, as though rehashing political fights would be a popular family pastime in fiction, unlike real life. (Your reference to voting third party as “throwing your vote away” makes me sad for a different set of reasons.) Is your issue primarily the lack of more political variety—Darlene getting on a soapbox for Bernie Sanders or whoever—or are there bigger structural issues you’re running against that make you dislike it so? DC: First, to your point that some people have trouble encountering opposing viewpoints—I welcome disagreement, especially on a show like Roseanne, which has seen every form of dispute from a simple snit to emotional knock-down drag-outs. For a long time, it was a relief to see a family that behaved more like mine than the saccharine families of sitcoms past. But I think you’re overstating both the variety of the voices on the show, and their respective volumes. No one but Jackie and Roseanne has talked about politics—even when there’s a mention of Trump in the finale, it’s just as “the president.” The EPs bragged about how the show was going to feature multiple perspectives, but it’s really only cultivated one (you can probably guess which). But I could watch the Conner family throw down all day, and to its credit, the show has returned to some reliable sources of tension, like money problems and Darlene and Becky’s conflicting personalities. I’ve made note of when the series has done right by its history, most notably with the changing relationship between the sisters. Watching them spar and make up as adults has been the highlight of the show for me—Becky no longer trails behind Darlene when it comes to delivering acidic barbs—as well as seeing how they deal with personal disappointments and ongoing financial struggles. It’s when the show attempts to generate tension outside of the lives of the now middle- and senior-aged Conner family that it falters. The writers have dutifully referenced the hot-button issues of our day, including the healthcare crisis, opioid epidemic, and immigration debate. But these stories all seem to be in service of crossing items off a checklist, both to reassure audiences of the show’s ongoing topicality, as well as to ameliorate the presence of a bigot. The inclusion of a gender-nonconforming character like Mark Healy is a welcome development, and Ames McNamara is a winning performer, but he has little interiority. We never learn how Mark feels about having an absentee father, or seeing Darlene struggle as a single, working mother. The bullying storyline fits within the show’s history of seamlessly working in social issues, but when Mark’s role doesn’t go beyond affording Roseanne a chance to be a decent person, the character just feels like a plot device. In fact, none of the new characters is well-developed; Harris (Emma Kenney) huffs about being made to leave Chicago, which inspires her to sell stolen clothes to make the money to return. But that teen rebellion, if it can be called such, is quickly quelled, first in a fight with her grandmother—one of the low points of the series—and then with a bargain struck around the dinner table. Then there’s D.J.’s daughter, Mary (Jayden Rey), whose entire motivation is just “be cute.” Sure, that’s practically a tradition for the youngest member of a sitcom family, and certain allowances have to be made for some shallow dives, given that there are only nine episodes in the first season of the revival. But, as I’ve pointed out in my coverage, the established characters are similarly limited. So I can’t say the show has lived up to its stated goal of creating discussions among a realistic family, one which represents many (presumably white) ones across America, when that family is no longer recognizable. Which could be overlooked if the show were consistently funny, but the writing is often lazy, preferring to rely on half-baked observational humor about such newfangled things as Uber and nutrition. Politics aside, this revival is middling. But, since these Conners appear to jibe with your own recollections, how do you see the show moving forward, Alex? AM: Ah, the exciting “part where we agree” in this crosstalk! You’re right, Danette—it’s undeniable the show has done a pretty weak job of fleshing out its new characters. Right now, the latest family members are mostly there for our original cast to bounce off of, and even then the exchanges can’t hold a bickering candle to the drunken heart-to-heart between Becky and Darlene, or pretty much anytime Dan and Rosie are cracking wise together. But it’s also been only nine episodes. I remember thinking the Conners weren’t terribly deep after the first half of season one, either. It took awhile to fill them out. And whereas you often see these latest convos as a case of diminishing returns, I tend to find them appealingly muted: older but not wiser, tired but intentionally so, like the characters spouting them. This hits its apex in the season finale, possibly the best of the run, where Dan hits his breaking point when the basement floods. Economics, politics, and friendship get tested, all through the filter of family and social pressures that lead us to make hard choices. Sure, it ends with a deus ex machina in the form of FEMA relief, but hey, Dan was coming apart at the seams with no way to feasibly get out of the mess save an act of god—an apt metaphor for the current prevailing political moods. Vox’s Caroline Framke smartly demonstrated that the show consistently approaches its storytelling from a “tolerance begins in your own backyard” view, in which the other is humanized only through Roseanne and her family getting to know minorities and demonized people personally (though I disagree that the writers were somehow unaware they were making this fairly clear point), and it again proves the series is best when dealing with the knotty contradictions of class, belief, and prejudice through a filter of personal interactions, face to face, to bring issues home to roost meaningfully. And that’s what I think the show could do better in season 11. Let some of these new characters come apart at the seams. With a longer season order, there presumably won’t be the same pressure to give us the people we love and the hot-button issues of the day. Instead, the show can focus on what the better outings in 10 did: give us an aging and not necessarily politically appealing family just living their lives. It may be more All In The Family than the original Roseanne, but there’s nothing necessarily wrong with that. Yes, it involves a certain degree of separating art from the artist (though just one among the many on this show), and I understand why some people can’t do that, but I would encourage them to try. The show has a lot to say, and some very funny and talented people saying it. What do you want to see going forward? DC: Even with an established premise and fanbase, revived series can flail, especially early on (see: Will & Grace). 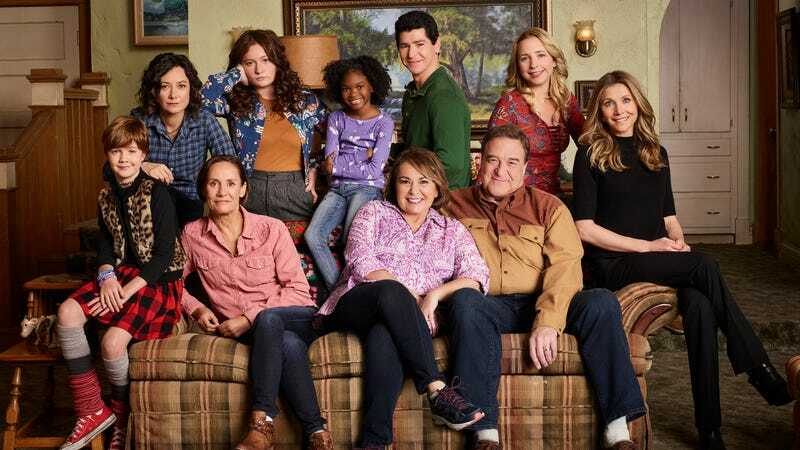 That Roseanne was able to recreate the family dynamic of the original, with multiple generations existing (and fighting and joking) under one roof, after two decades away, was no small feat. Though they need fleshing out, Harris, Mark, and Mary are poised to take over for Becky, Darlene, and D.J., just as the Conner sisters are basically Roseanne and Jackie 2.0. Along with the expanded episode order, everything is ostensibly in place for the show to move the conversation forward. But there’s the rub—this framework and these resources all existed in the first season of the revival, and they were still squandered. Roseanne’s creative team wasn’t able to strike a balance among the many players, generations, and beliefs; there were multiple times when it felt like the A and B stories were happening in different episodes. There was also a surprising lack of interaction among the younger characters—maybe Roseanne and Dan are cool grandparents, but the idea that Mark, Harris, and Mary would only hang out with each other in their presence doesn’t feel very realistic. There are heartening signs for the 11th season: Bruce Helford says the al-Harazis, the Muslim family introduced in “Go Cubs!,” will be back, and the writers’ room will be more inclusive when Jena Friedman and Transparent’s Ali Liebegott join Norm Macdonald and Wanda Sykes next year. I believe there’s still a place for Roseanne at the dinner table—I just need the show to make more room for the rest of its characters. AM: They’re going to need a bigger kitchen table, then. That fucker is already at the breaking point.